When I was growing up, I didn’t get to see lemons growing on trees. No, in Illinois, citrus was certainly not a local crop. However, several years later when I moved to Austin and started gardening, one of the first things I wanted to add to my garden was a lemon tree. It has to be container grown here because we have to move it inside when we have below-freezing temperatures. But, for most of the year, I get to see a lemon tree in my own backyard. Actually, I now get to see two lemon trees. My friend Kirsten, an amazing garden designer and gardener, entrusted her lemon tree to me when she and her husband moved from Austin to Edmonton. Happily, her tree is still doing fine (even though my gardening skills pale in comparison). Both trees produce Meyer lemons which can take almost an entire year to mature from blossoms. The lemons become ripe and ready to pick in late December or early January. I seem to have good luck with lots of lemons one year and then not so many the next. This was a good year. I picked plenty of lemons for limoncello, lots of vinaigrettes, and more. Since only the peels are used for limoncello, I had a couple of cups of lemon juice in my freezer waiting for inspiration to strike when I saw this citrus tart in the January issue of Living. 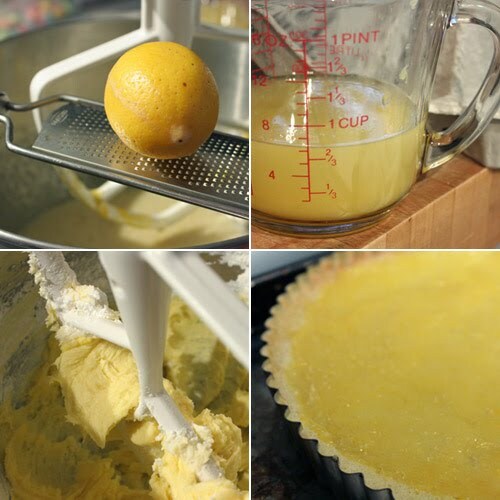 The tart combines lemon and lime juices which seemed perfect since the lime would sharpen up the sweeter Meyer lemon juice. This tart’s crust is a press in the pan type made with butter, flour, salt, ground almonds, confectioners’ sugar, and an egg yolk. I used almond meal that I had on hand rather than grinding blanched almonds in a food processor. The dough was a little sticky, but it was simple enough to press it into the tart pan. Then, it was placed in the freezer for 20 minutes. The crust was baked for about 23 minutes and left to cool while the filling was made. Eggs, sugar, salt, fresh lemon juice, lemon zest, fresh lime juice, and cream were mixed and then poured into the cooled crust. The tart went back into the oven, at a reduced temperature, for about 25 minutes or until set. I had to leave mine a few extra minutes until the center was no longer jiggly. I whipped some leftover mascarpone with cream and a pinch or so of sugar, and my goodness, can someone please tell me why I had never before added mascarpone to whipped cream? That is definitely one of the most delicious concoctions, and it made a very nice topping for the tart. The crust was buttery and rich and possibly just a tad too rich and too sweet for me, although I didn’t hear any complaints. Still, I might opt for a standard shortbread crust or even a pate brisee next time I make this, but I won’t change a thing about the filling. The mix of lime and Meyer lemon juices was fresh and bright and just enough sugar was added, and of course, picking the lemons yourself makes them taste even better. very nice - how many lemons do you get each year? Christo: Not that many--my trees aren't very big. Maybe 15 lemons per tree in a good year. I just got a whole bunch of lemons from a friend. I've been trying to figure out what to make with them. a little sweet and a little sour.. I've always wanted a lemon tree. My beloved tart. I was just thinking about making it. Looks smooth, silky and delicious Lisa. What an elegant and scrumptious tart! I just got some meyer lemons and would love to make it! Gosh, that looks brilliantly refreshing!!! You're making me all ready for spring already, Lisa! The tart looks absolutely fantastic! My dad planted a lemon tree in our yard when I was growing up and believe me those babies grow with no care at all! This lemon tart looks and sounds exquisite! 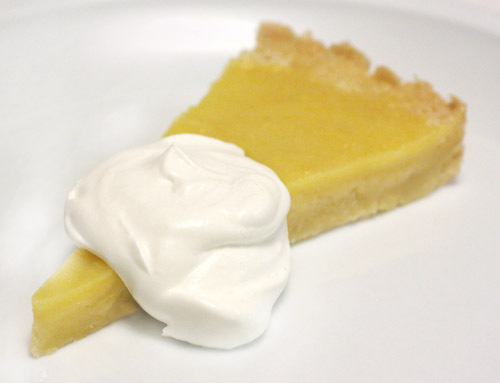 I love a good, tart, simple lemon tart and with that combo whipped cream-mascarpone must be out of this world. I make a similar tart and it is definitely one of our favorite desserts. Wonderful, I'd like to try making this too. Somewhere I have Pierre Herme's recipe for lemon tart. No lemon trees here in the UK, but I do have apple. I just need to make more good use of it. I can be such a lazy bones. i can't help it--i don't like lemon desserts. they're usually just so tart and in-your-face. that said, this looks absolutely beautiful and is a lovely use for your lemons. One of my favourite tarts and the addition of mascarpone with whipped cream sounds delicious. 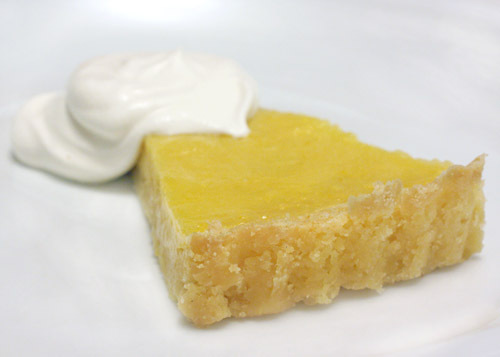 I have a weakness for any lemon desserts and this tart would be divine. I grew up having a very fragrant lemon tree in my home & naturally I am inclined to citrus desserts. I can have them anytime during any season. So refreshing! This is one the best sound tarts I have ever seen Lisa. I remember when I was a kid my cousin moved to Florida and told me about the citrus trees - I was in awe! Just like I'm in awe of this gorgeous dessert. Mascarpone whip cream sounds dreamy. wow, this is exquisite. I don't normally like citrus tarts but it's clearly time for me to change my mind. So lucky to have lemon tree in your garden. When I was a child living with my family in Mersin, South of Turkey, we had three lemon trees in our garden. The scent of their blossoms was enough to make me fascinated. and it was wonderful to get out and pick lemons from your own trees. Mom would send me to get a few lemons while she was cooking. This may be the reason why I'm a big fan of lemon now. Your tart is shining! It looks so fresh and yummy! This citrus tart looks absolutely exquisite! I adore Meyer lemons! I love the bright flavor of citrus desserts and this looks amazing. I just ordered a batch of Meyer's lemons and you've got me inspired. I absolutely love lemon desserts - and mascarpone is good with just about anything. I love it, but it's expensive so I usually save it for something special. What a gorgeous and refreshing tart! Adding mascarpone to whipped cream is such an awesome idea too! YOu're so lucky to have lemon trees in your garden, and 2 of them! Great way to use up the fruit. That tart is making me hungry for dessert.